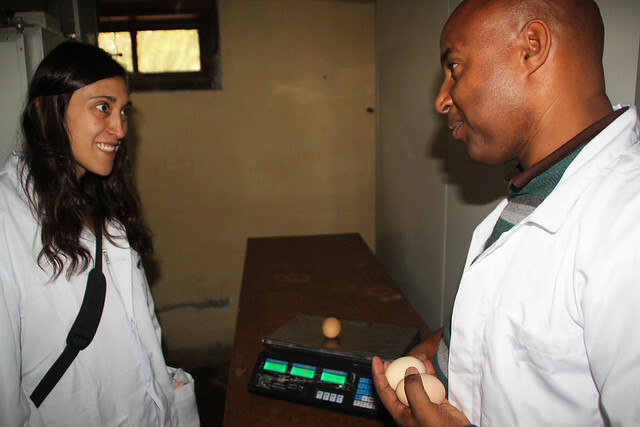 Maria Lozano-Jaramillo, a PhD student from Wageningen University, recently worked with the African Chicken Genetics Gains (ACGG) in Ethiopia for two months. In this post, she shares the highlights of her visit and work with the ACGG. Can you summarize your achievements in the two months you spent in Ethiopia? The two months I spent in Ethiopia were an amazing experience. What I experienced has made me an active part of the project, it has increased my knowledge of Ethiopia’ poultry sector, and I have built networks with key people working in the sector. Being in The Netherlands makes it hard to be completely involved with the project, without knowing the project team personally, and without knowing the things that are being executed on a day-to-day basis. I was able to solve these problems by being in Ethiopia. Most of the objectives I planned to do were completed, and although a few tasks fell through, I was able to take part in some activities that I did not know would be possible. During this visit I was involved in training programs, a national innovation platform and different meetings, which allowed me to meet a wide range of ACGG stakeholders, and gain knowledge not only on how poultry is managed in the country, but also on how it can be improved. I also went visited the research centre at Debre Zeit, and learned about the facility, and about how researchers there will play a key role in managing the chickens during the project, giving me a better perspective of the execution of project on station. I also joined some ACGG Ethiopia team members to visit farmers, which gave me also a better idea of how the field testing will be carried out. Working at the International Livestock Research Institute (IRLI) with the team members made my trip successful and the project members really made feel part of the team. I look forward to coming again soon. Maria Lozano-Jaramillo with female smallholder farmers from the Tigray region and ACGG Ethiopia project staff. 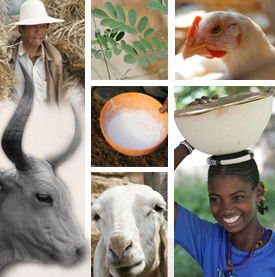 How will the Ethiopia trip help you achieve your goals at Wageningen? As part of my project I will develop prediction maps of potential suitability for all of the breeds that will be tested in Ethiopia. I will use the information collected during this trip to develop the prediction maps, and to write my first research paper. This data will allow us to see which areas of the country would be potentially suitable for each breed. Being able to visit Ethiopia broadened my understanding of how the project will benefit smallholders, and I was able to familiarize myself with the broad issues in the project. This will make it easier for me to do research, because now I feel closer to the project. I look forward to start working with the collected data, and to be able to start completing all of my PhD objectives. Thanks ACGG Ethiopia! Tags: Maria Lozano-Jaramillo, student. Bookmark the permalink.